Sushi Hachi is one of those local gems that has received lots of rave reviews due to their homely atmosphere, and simple, comfort food that is familiar to Japanese and non-Japanese alike. They have the staples of Japanese cuisine that’s known and loved all over, like California Rolls, Cones, Tempura, and the more adventurous, authentically Japanese edibles like Monkfish Liver and Squid Innards. 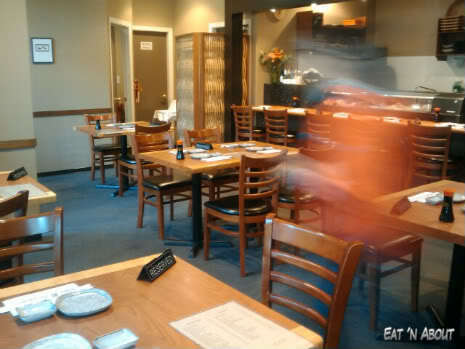 That’s why on any given day, you’ll notice that this place is packed with both Japanese and non-Japanese food lovers. 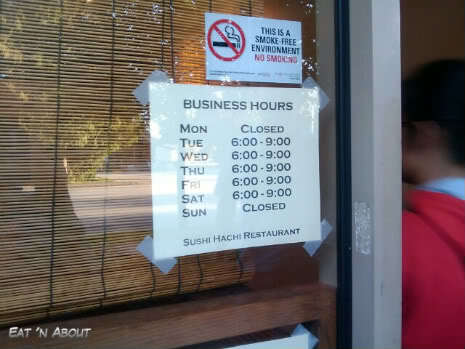 They must be doing well though, since as you can see, they’re only opened 5 days a week, 3 hours per day. But that could also be explained by the fact that there’s only the lone couple that operates this establishment. You better make reservations if you plan to come here, ‘cuz as you can see, every single table here has a “Reserved” sign, and it was a Tuesday when we came. I saw the mound of uni (sea urchin) shells on the chef’s counter so I wanted some. They were $18 that night but I really wanted it so I ordered it. The picture doesn’t show the color of the uni very well but they came in 3 colors, 2 pieces each. The colors were yellow, yellow-orange, and deep orange. I don’t quite remember but the flavors ranged from mild to intense. I think probably the yellow was the mild, while the deep orange was the intense flavored. It was very fresh and very good. What surprised me was that the spines started to move all of a sudden! I was so shocked! I mean, I’ve had lobster sashimi where the lobster still moved but for some reason I didn’t expect the sea urchin to! It was quite shocking. So after that we had a few normal choices. 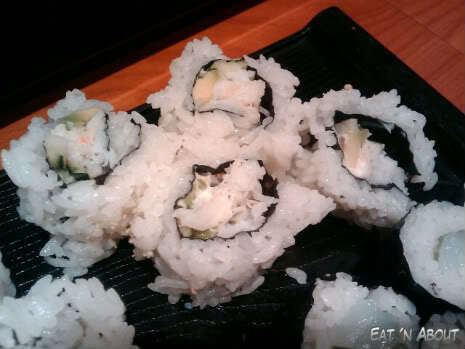 Above is the California Roll with real crab meat. Honestly I really didn’t find this especially delicious with the real crab meat. 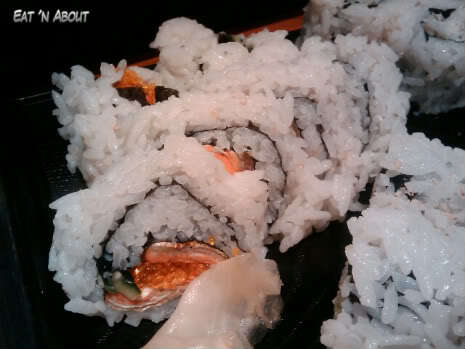 It was pretty tasteless actually, and the sushi rolls were pretty loose, almost falling apart. 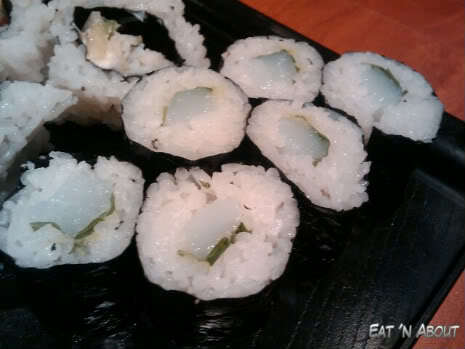 Next was the Ika-shiso Roll. I’ve never had shiso before so I didn’t have expectations. It turned out to be very pungent and minty. I much prefer Sushi House’s Ika & Natto Roll to this. Then there was the BC Roll. Again, not especially exciting. I like Aji Taro‘s version better as they have grilled salmon skin as opposed to this place where it’s really just a sort of dried salmon. So again I wasn’t wow-ed. The next two were the adventurous choices. 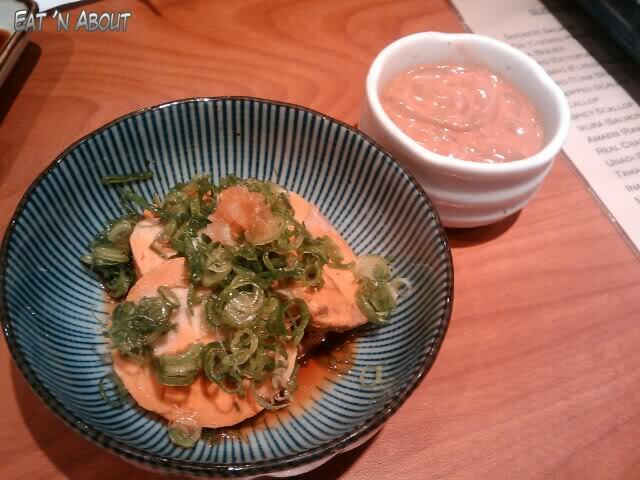 The Ankimo (Monkfish Liver, $6.50) was delicious. It wasn’t fishy like some people say they are, and it was creamy and intensely flavored. I liked it, but Boyfriend, not so much. He doesn’t really appreciate things like this I don’t think. The small white cup was the Marinated Squid Guts Shiokara ($3). I wanted to try something interesting so I ordered it. When I placed the order, the lady asked me if I know what it is, and that’s it’s quite salty and fishy, that Japanese people really like it. I think people had ordered it before and didn’t like it. I knew what I was getting into though, in that it won’t be your usual type of westernized Japanese food, so I went through with the order. It actually wasn’t as fishy as she made me to expect. I mean, it was fishy but not overly so. It was salty though. It wasn’t something that I can only take one bite of and leave, I mean, we did finish it, but probably won’t order it again. It wasn’t bad, just different. Lastly it’s the miso soup that everyone raves about. It’s made with a piece of fish in it. It did taste better than the average miso soup. Boyfriend enjoyed it. Overall it was a nice dinner but we both agreed that we don’t know what the big deal was with this place. It wasn’t insanely delicious or different, and not especially cheap either. We probably might come back someday but we definitely won’t be in a hurry to. Thanks for the write-up, I was thinking about this place too and wondering if the hype was warranted. From the pictures of the rolls, I’m not so sure. Ya I agree. After trying it both of us didn’t really understand the hype either. Yeah those rolls look very bad. The ones from AYCE place look better than that. Not sure if it’s just an off night for the sushi chef. Too bad. We also tried it once and weren’t wow’ed as well. I think Seto has better sushi. Contrary to what Sherman wrote, I am tempted to go because you made some emphasis on the fact non-“normal” items were good. Was it difficult to get reservation? I guess it’s not particularily difficult, as I had a coworker call for reservations at 1pm for 6:30pm the same day and she was able to reserve a table for 2. Their rolls are nothing special. Neither is any of the ‘cooked’ food. But their sashimi is definitely higher quality – try their ikura and get chef recommendations or the assorted sashimi platter if you give them another try.. I wondered about this place after reading other reviews. Unfortunately, their limited hours makes it difficult to fit into my schedule. Maybe they like to cater to a few special customers only. Those sushi rolls sure look sloppy. I think I’ll stick to Sakura Sushi for my sushi fix when I’m in Richmond. 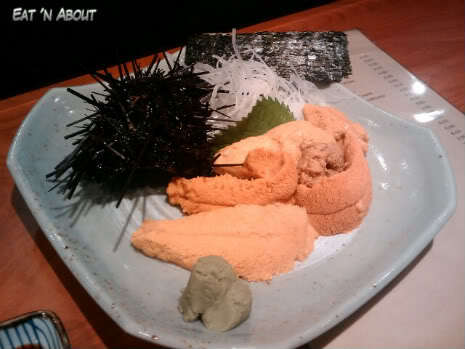 I want to try the uni, ankimo, and shiokara! I’ve never had uni before, because I’ve always been scared that it isn’t fresh (coming from Toronto). I guess they are more alive here! The rolls here are always sloppy, but this place is famous for it’s sashimi. You’re quite adventurous, we should dine together…I love trying new things! I love this place a lot, they have some of the best raw fish out there. The cooked stuff is really nothing special (except for the unagi – eel). If i were going to order rolls, i’d leave it for some of the other establishments. I tried the unagi – they bbq this stuff in house, so it’s definately better than the run of the mill place. In addition to this, they know how to make the rice properly. If you eat enough sushi, you would appreciate rice done right. It’s got a bit of a sweet flavor with the vinegar. The fish is really good as well. My favorites being the flounder and otoro. If you’ve never tried otoro, you gotta try it. it really doesn’t look like much, but it melts in your mouth. Not a lot of places have otoro, but they do, so i’d give it a shot. As a sushi snob, screw the rolls and eat the fish, otherwise don’t bother otherwise you’ll leave disappointed.